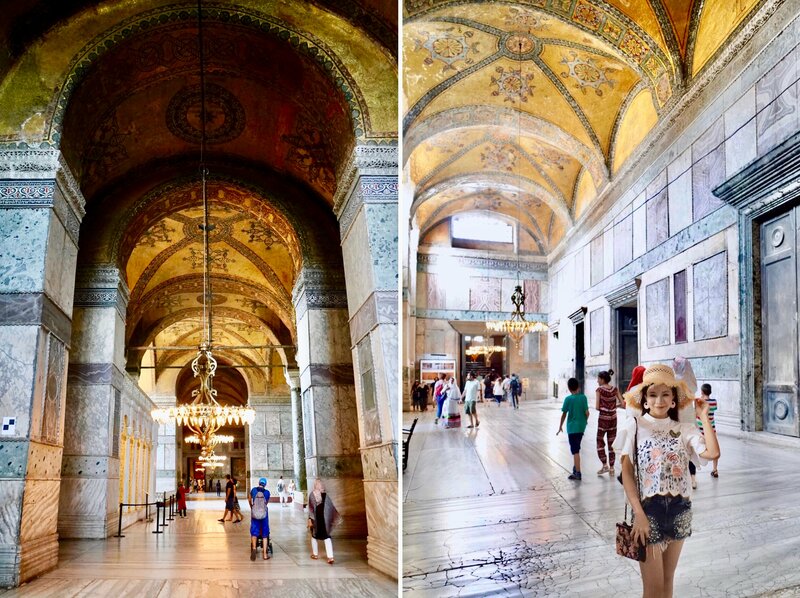 Travel with me #121 : The Hagia Sophia, Istanbul! Welcome to another blog post of mine! I can't wait to connect with all of you and hope you really enjoy what I have in store for you today. You'll not believe just how amazing the landmark is that we are going to explore together. Located in Istanbul in Turkey, this iconic building has to be seen to be believed. I really hope that my photography can help you experience this beautiful landmark the same way that I did. What is this amazing place called? Hagia Sophia. Stay right to the end to see it as you've never experienced it before! 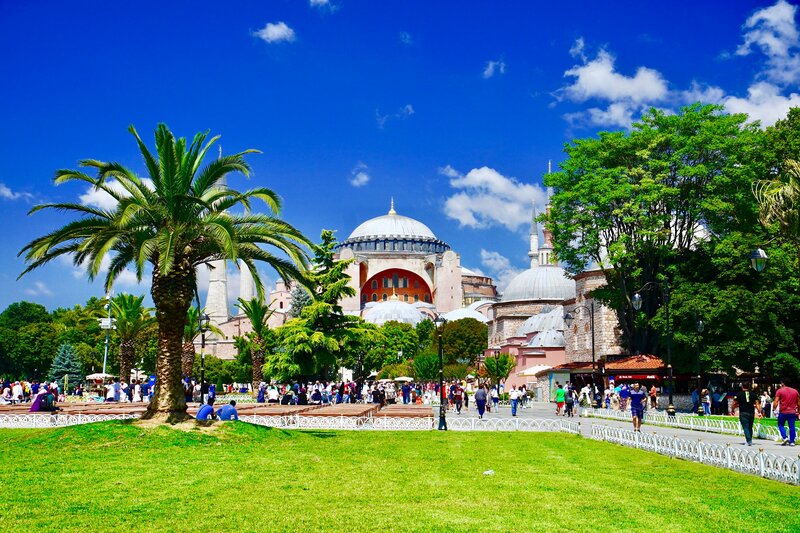 Right next to the Blue Mosque that we saw in my last post, the imposing Hagia Sophia has a long, rich and colourful history. 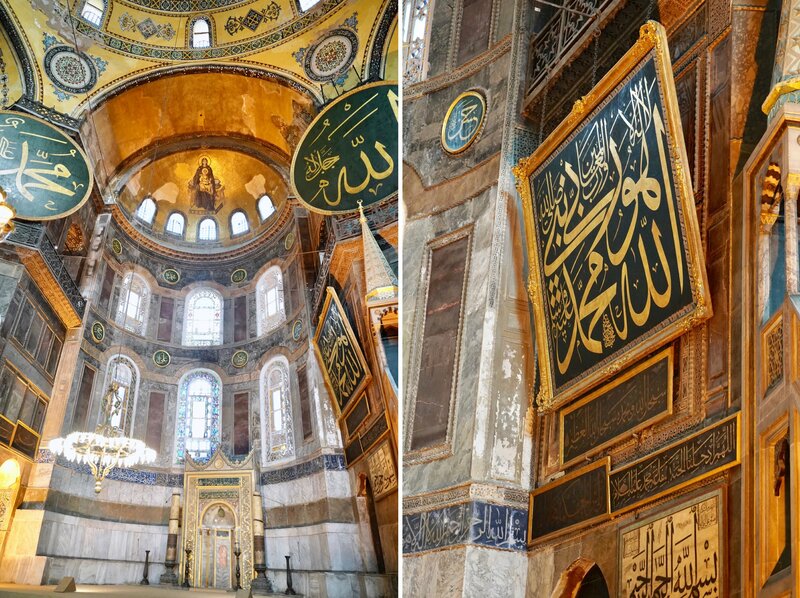 'Hagia Sophia' is derived from the Greek for Holy Wisdom, which reflects its roots as a Greek Orthodox Christian cathedral. First built in 537 AD, it was the largest building in the world at the time. You can see has a very distinct dome shape, which was particularly unique at the time. Though we now see this dome shape often in Islamic architecture, this building style wasn't always as common. When first built, Hagia Sofia would have been truly unique. The dome shape only became widely synonymous with Muslim architecture during the Ottoman empire, when the Sultans realised that a unified religious architecture would help unify the empire. They chose the dome shape to be one of their iconic structural shapes and they are now founds all over the world where Muslims worship. 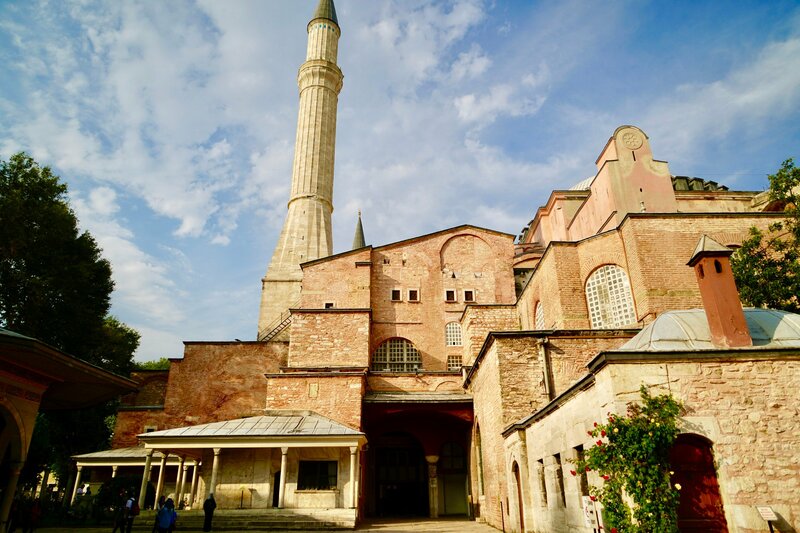 For 900 years Hagia Sophia was an orthodox cathedral and served as an important place of worship and religious governance until 1453 when it then became a mosque under the Ottoman empire. Amazingly, it is even larger than the Blue Mosque even though the mosque was built 1000 years later. It truly is a wonder of design and architecture for a building so old. It inspires and dominates the skyline even now, so in 537 AD it must have left those who visited it in complete awe. Hagia Sophia is mostly built from small bricks and mortal, which makes it look to me a bit more rustic than buildings cut from large stone blocks. A bit like someone started off wanting to build a house and then just forgot to stop building! It only took five years to build, and replaced another church on the same site. That church was constructed mostly of wood, and thus it burned down to the ground in 532 AD. 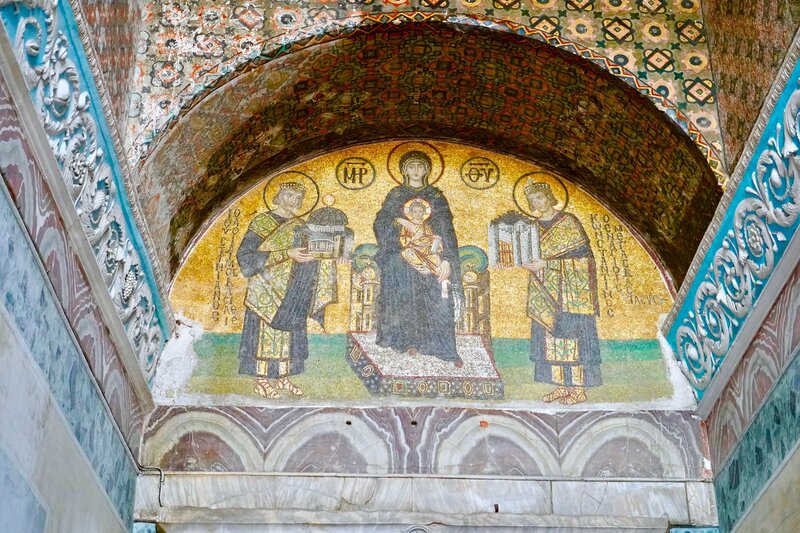 Emperor Justinian the 1st immediately commissioned the construction of a new church on the site, which was to become Hafia Sophia as we know it today. An amazing feat of engineering, historical records tell us that construction took over 10,000 workers to build. Unfortunately, only 35 years later the dome suffered damage after a major earthquake, and collapsed in 558. Historians believe the collapse was blamed on the dome being too 'flat'. The emperor commissioned an architect named Isidorus to fix the roof. He used lighter materials and increased the arch of the roof to create a stronger shape. This dome has now stood since 560 AD! 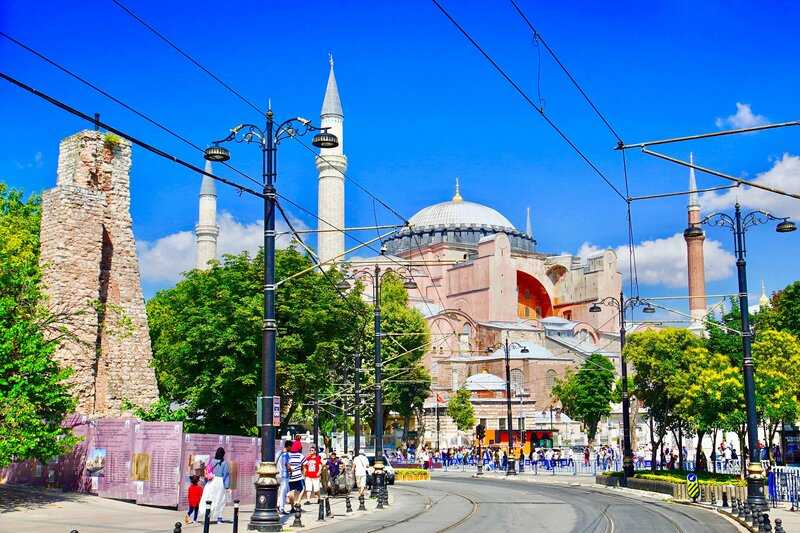 Hagia Sophia's 82m length and 73m width isn't just comprised of the main dome. There are also additional structures and buildings that make up the entire area. I found walking around the building, not just seeing the standard front view, to be fascinating. Venturing inside, I was as impressed with the beautiful interior as much as the exterior. The building is no longer a centre for religious activities as it has been for thousands of years - it is now a museum. This means that elements from both Christian and Muslim history have been preserved within, making it a fascinating place to explore. I knew that Hagia Sofia was famous for its great columns and mosaics, but I don't think anything can prepare you for the scale and complexity of them. The vaulted dome ceilings, with the soaring columns, look more like the inside of a cathedral. However, that symbolism is then mixed in with many different elements from the Islamic history of the building. It makes for a truly unique mix of different designs found together in very few places in the world. The gold on the mosaic in the vaulted dome above makes the ceiling seem to almost glow, shining a beautiful golden light down onto those of us standing below. From the outside, the central dome dominates your focus. Inside, however, you realise that there are in fact multiple domes that interconnect. Each one is decorated different to the other, with gold colours and religious imagery being the most common colours and motifs. Holding up the massive ceiling are the beautifully stacked, carved and decorated columns. Standing under the 55m central dome, admiring the immensity of Hagia Sophia, I did feel very small and humbled. Stop! Look very carefully. I wasn't just taking photos of a bunch of random people... I found a fury friend, in the last place I'd have expected! Up at the front of the giant ex cathedral I noticed the cutest little cat. He looked like he had positioned himself in front of the crowd, ready to give a speech! Perhaps he is the caretaker of the building and wanted to address the gathered crowd about the proper conduct while visiting. He looked completely un-concerned by his upcoming public address, but I thought I was worried he might run off if I approached him too quickly. I did hang back for a bit, my eyes drawn between wanting to admire the majestic domes and columns further, and wanting to go and meet The Caretaker. I decided that the building had already been standing for well over 1000 years, so it would probably still be there in a few minutes after I'd gone and made a new friend. I got a little bit closer to 'The Caretaker', and after he had meowed his instructions to the waiting crowd, I wanted to go and meet him. He seemed like such a friendly little cat and I knew he must be quite used to visitors. I think he knew how cute he was as he was almost posing for the camera! I loved making a new little furry friend. He must get looked after very well by tourists. As much as I joke about him being The Caretaker, I did wonder if he was a stray that just wanders into the building through some secret entrance each day, or if he belongs to the museum. He seemed completely un-phased by all of the people around him, though he was quite timid when coming to get food. Because of that I suspected that he was a stray, because he had 'street' instincts, but must have visited regularly. What a beautiful little man! So good to meet him. I knew he'd be supervising all of the tourists in Hagia Sophia and making sure we all enjoyed ourselves. As you can see from the photo here, there was some pretty extensive restoration work going on during my visit. In such an old building it is essential that the structure is kept strong and safe for all of the visitors, and the preservation of such a landmark. 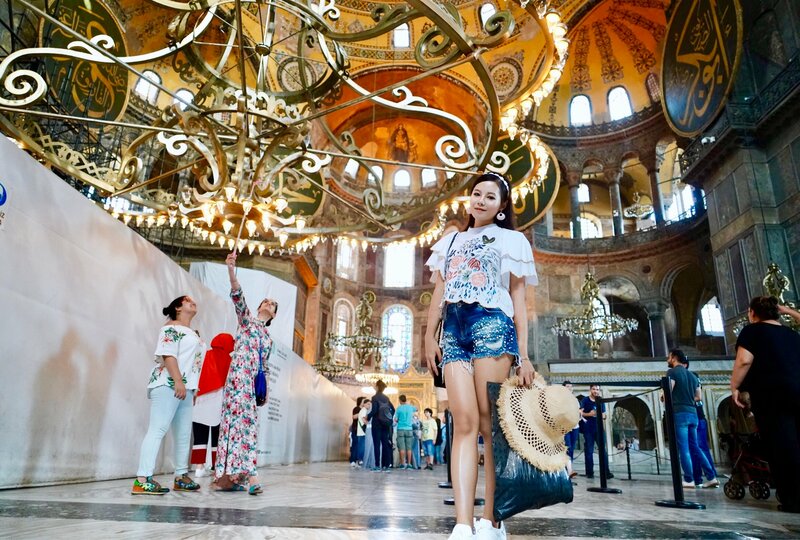 This is especially important since the the history of Hagia Sophia is marked by regular earthquakes and earthquake damage. The building is a UNESCO world heritage site and has seen extensive renovations since receiving the prestigious status in 1993. On top of that, there's the priceless art that adorns every surface of the building's walls and ceilings. Everything from the sun to damp to tourists can cause damage to these pieces of work. They could never be replaced so they must be restored. The museum does a great and unending job of maintaining the splendour of the building. 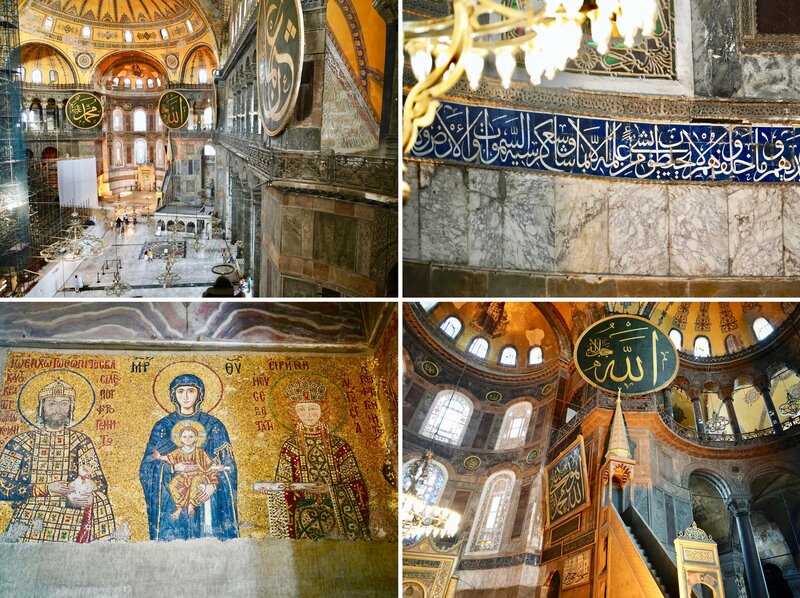 Within the walls of Hagia Sophia there is so much to see, all of which is extremely interesting and spectacular. In this section I want to take you on a little tour of all of the little details that I noticed within the museum to give you a better sense of the place. For example, look at these amazing chandeliers that are found suspended from the huge domed roofs, providing light and a sense of grandeur to the already majestic space. Some areas are so fragile that tourists can't go near them or walk on them because they could suffer damage or general wear overtime. I also wished I could have read what some of the amazing text said. The art and style are so beautiful but I had no sense of the meaning. Can anyone help me out with the meaning behind the large text and symbols on the giant circular green paintings in the photo here? Me for scale to show how large this light was! Holding up many areas of the ceiling were columns, but not just boring stone columns. Even these were ornately decorated, and as you can see behind me here, plenty of gold still featured here too. I loved the contrast between the white stone columns and the gold coloured metal dividers separating this private area of the cathedral/mosque/museum off. Even the doors are massive, as you can see here! In ancient times, the cathedral served as a place of safety for those fleeing persecution. By law, the religious status of the building allowed it to be safe from attackers and anyone seeking to do harm on people. Many people harboured themselves safely here over the years, and perhaps these really big doors helped keep them safe too! This doorway was fascinating. At one time, it looked like it had actually been a door, but the door had been replaced with a stone carving. Next to the large door stood a smaller door, which still had an opening. I wondered at what point in history the door had been removed, and replaced by a carving? Why close the door up, and if you needed to, why not just put a wall instead of a fake door? The carving was so good that from a distance it just looked like a normal door. Has anyone else ever come across doors that were carved but not real doors? Do you know why this might have been done? Let me know in the comments below! 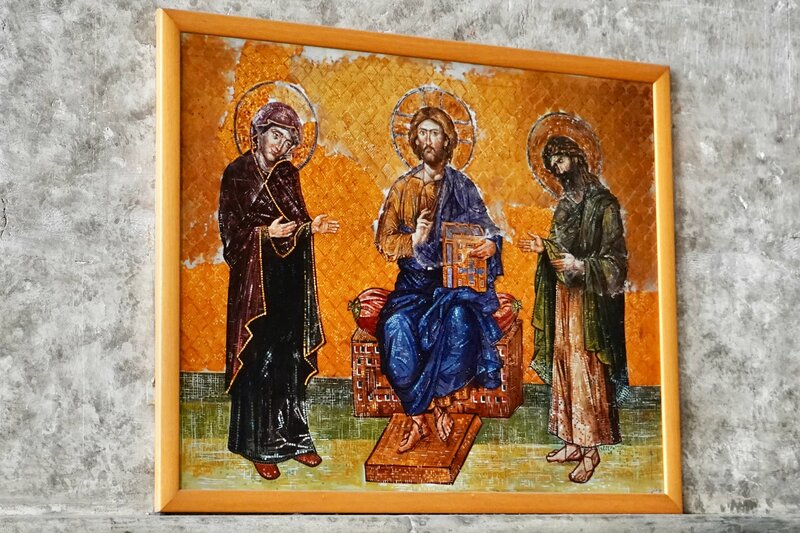 Some of the most famous art works within the museum were the mosaics. These mosaics were incredibly intricate and are some of the greatest surviving examples of such art work in the world. Most of these exhibits were found in the upper gallery of the building and as can be seen from the photos, many of them are incomplete. This is because over time there has been many different natural events as well as simple time, that has caused damage to these beautiful works. The museum, however, now takes great pains to preserve the historic works. 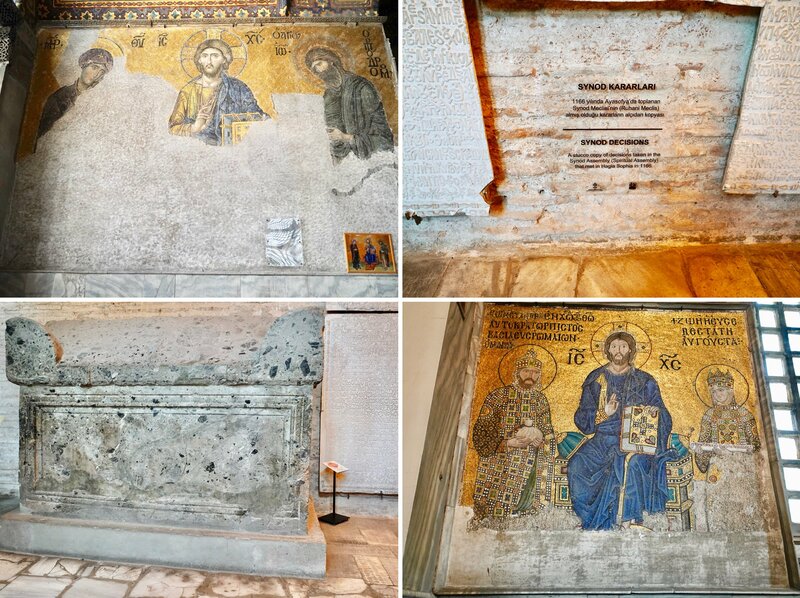 Above in the bottom left is one of the most famous mosaics. It shows a triumphant infant Jesus, next to John the Baptist. 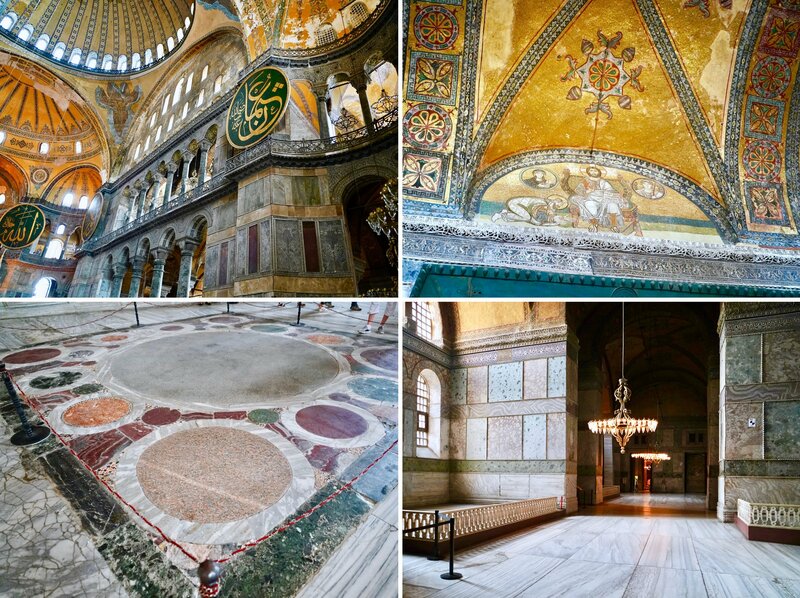 You could spend literally hours searching through the halls, galleries and central chambers of Hagia Sophia. There is art, architecture and beauty, every place you look. The range of different eras that are represented here reflect the long long history of the place. According to experts, there are still areas below the church that have not been fully explored. They are submerged under water and are currently inaccessible. In the adjacent buildings there are buried the remains of five different Sultans of the Ottoman empire, so imagine what secrets could be buried in the tunnels below the museum. I'd love to find out! 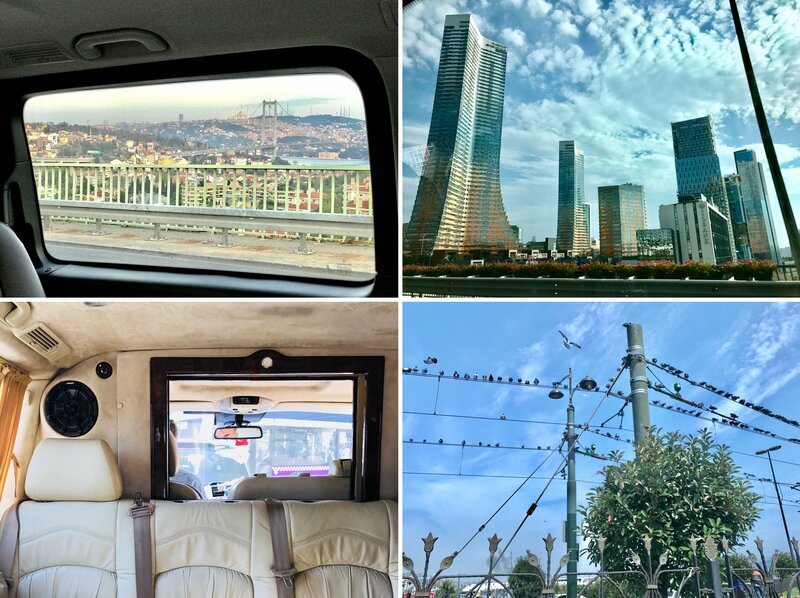 Cruising through the massive city of Istanbul, a city of over 15 million people, I had some amazing views of the city. But I also had some amazing views inside too! 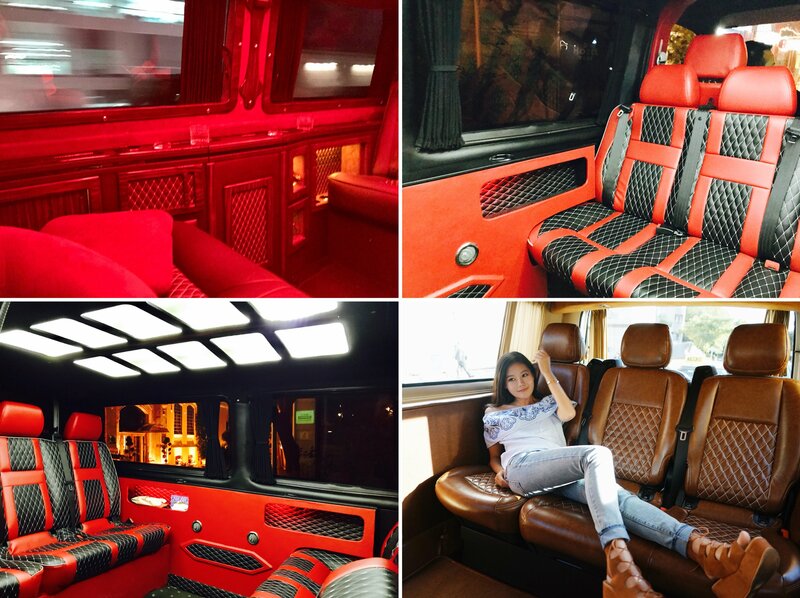 Just look at these cream leather seats! This was the most crazy Uber that I had ever been it. I couldn't believe that this was basically a 'taxi'! However, I discovered later in my trip that this wasn't a one off lucky chance. Over the course of my stay in Istanbul I used many different Ubers and found that this style of Uber was almost the normal type! 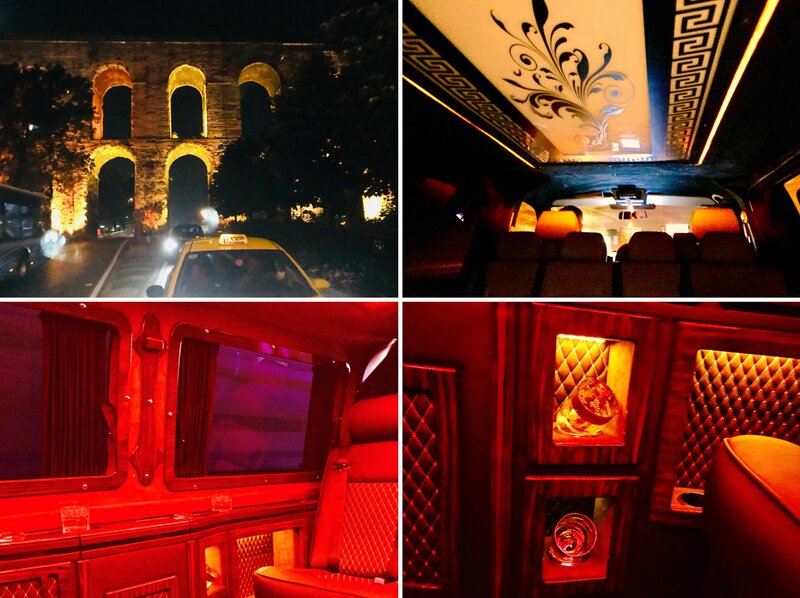 Just look at some of these other crazy cabs that I took. This one had a giant light on the ceiling, like an ornate painting, as if we were in a Las Vegas casino, complete with red lighting all around! Racing red seats and brown leather seats to match my shoes! 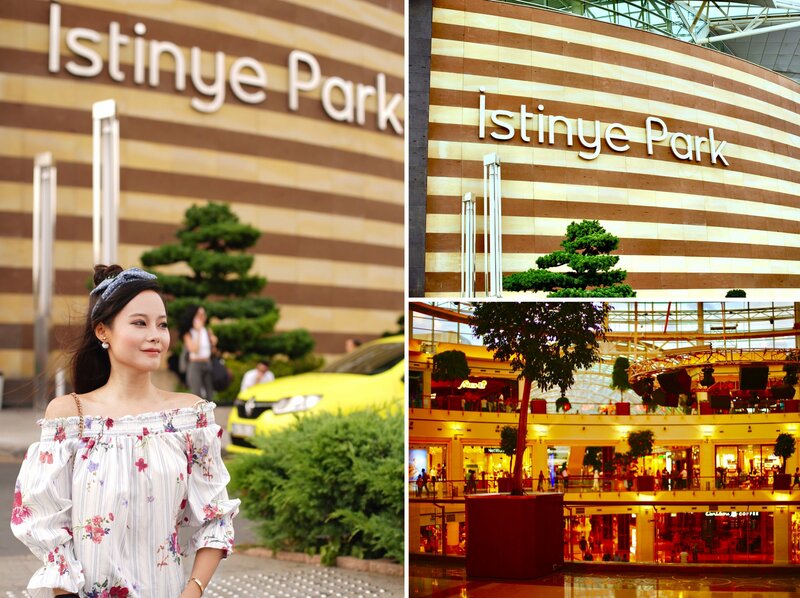 Istinye Park is what I would consider a mega shopping centre. 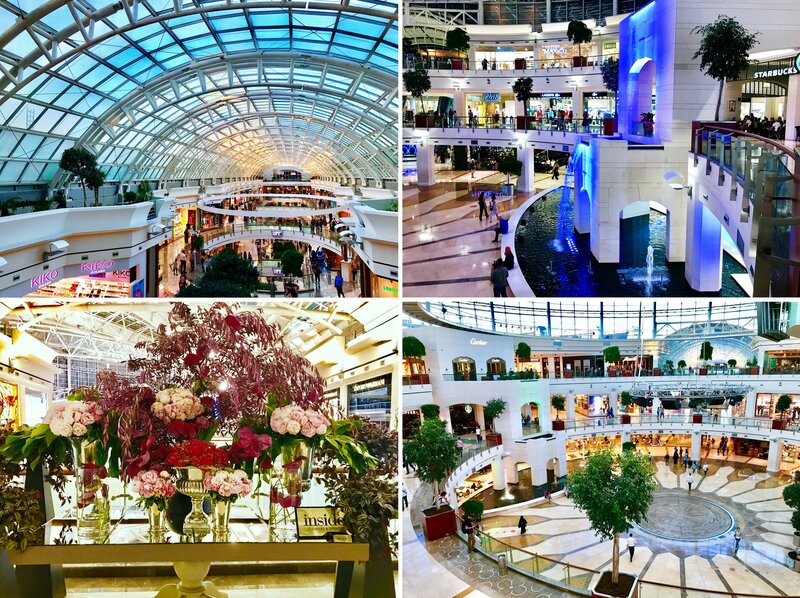 It has over 300 stores, four levels of underground parking just for the shopping centre, and 85,000m² of retail area. It even has an open air area complete with park and dozens of restaurants. 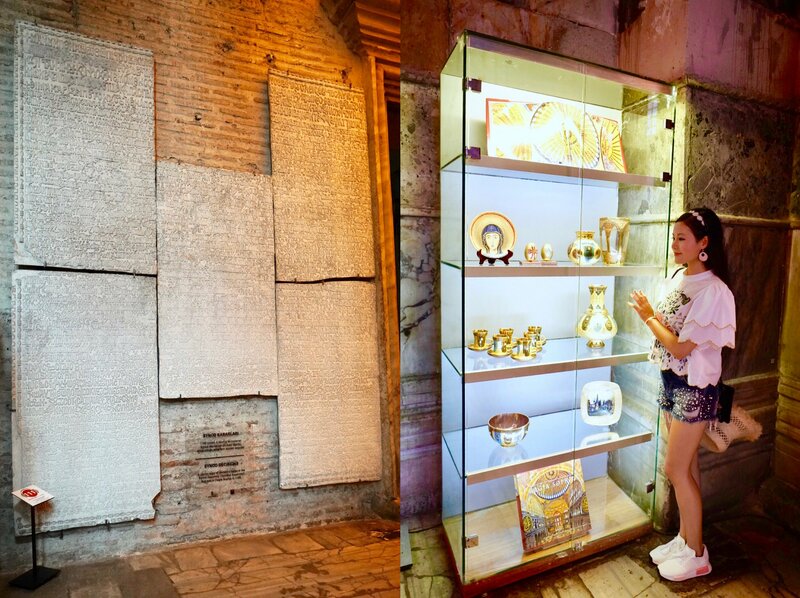 First opened in 2007, it has become a massive attraction for both tourists and locals alike. The design of the building is amazing. It's absolutely huge and has everything from trees to a waterfall inside the massive glass arched roofs. Having been here before and having eyed up a few different places to eat, I didn't take long to look around. I needed to get some food in my tummy, because I was hungry! 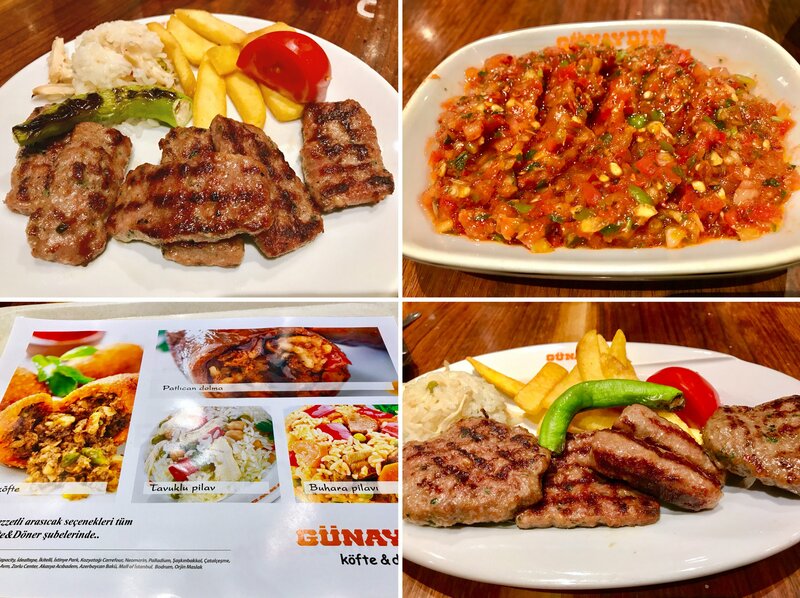 I settled on Gunaydin Steakhouse because it looked like somewhere I could get some food, quick! 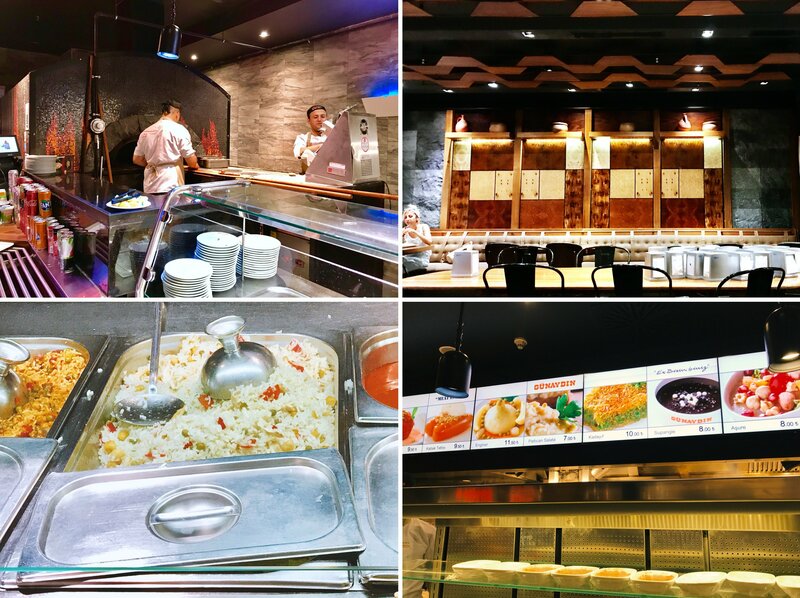 With a range of different foods, and plenty of meat on the menu, it wasn't hard to pick a bunch of different dishes to satisfy my taste buds. Half restaurant, half fast food canteen, it still had a great vibe. 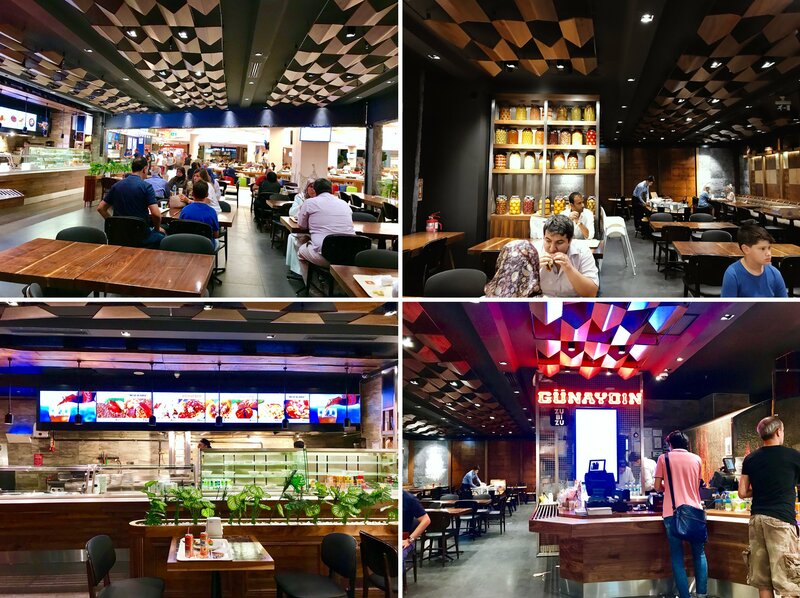 I felt like of like I was in a food court, that you get in these big shopping centres, but Gunaydin Steakhouse had its own little section off to the side with its own tables and decorations. You still ordered your food up at the counter and took it to your table, though, as you would in a food court. Since it was a steak house I definitely had to order some meat. So I got some beef as well as some beautiful side dishes and soup. I loved the side salads with the big serving of meat, so I felt quite virtuous (as well as really full). The desserts were a little bit... pre-made. They tasted OK but you could tell they had perhaps been made the day before or had been sitting there for a long time. With that said, they were still pretty good after a long day of sight seeing! 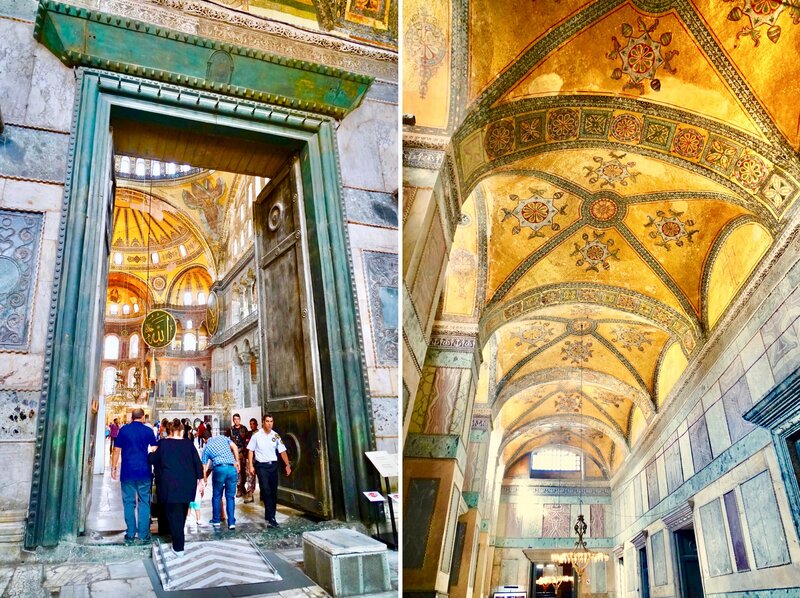 I hope so much that you enjoyed this epic post about the amazing Hagia Sophia. I told you you would see shots of this historic building, like you'd never seen before. And here they are. On my way back home after dinner, I saw the sun setting and since I was passing close to the historic landmark, I wanted to go and see it in the orange sunlight. The view was even better than in the day. The rays of sun bouncing off the red stone brick made it look even more massive and beautiful. I had to get the drone out to see it in all its glory. 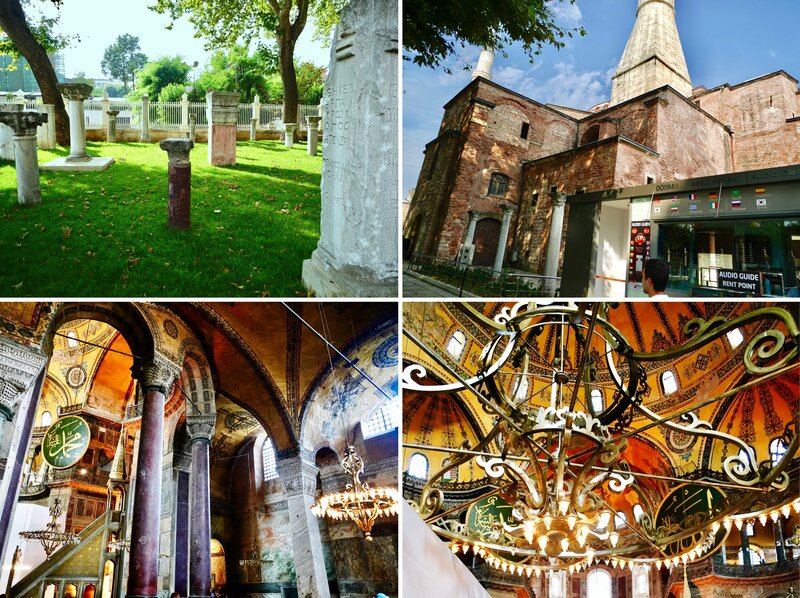 There are few places that you will ever see shots like these of the ancient Byzantine cathedral. You, Steemit friends, are very lucky, as was I when I managed to get the shots with such perfect light and timing. I can't believe I have come to the end of another post. Reliving my time at this stunning building has been really special and I hope you can appreciate and see the splendour of this building. I asked a few questions in the post - if you know the answer to them, comment down below! If you enjoyed the article or some particular photos, I'd also love to hear from you. Also, if you like content like this, and you want to keep supporting Steemit, then please do give me a follow so you don't miss any future posts and stay part of my community with me! I love all of my followers and love hearing from you all. Have a great day, all of you, and I'll leave you with these final shots of this beautiful place that I am so humbled to have visited. Check out my video with some aerial footage! 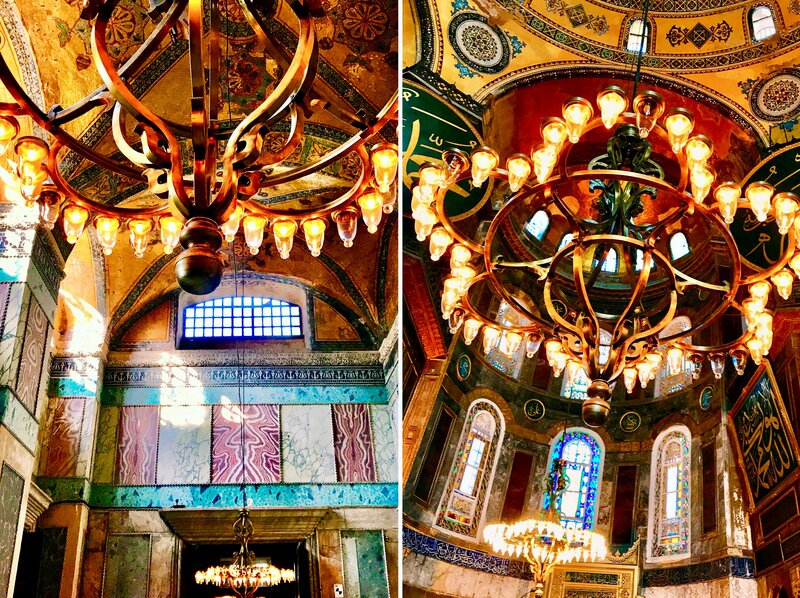 A stunning tour of this ancient Byzantine Cathedral, @sweetsssj! As always, what sets your work apart from the usual touristy travelogues is the amount of research and your vivid firsthand reporting of what it feels like to actually be there. 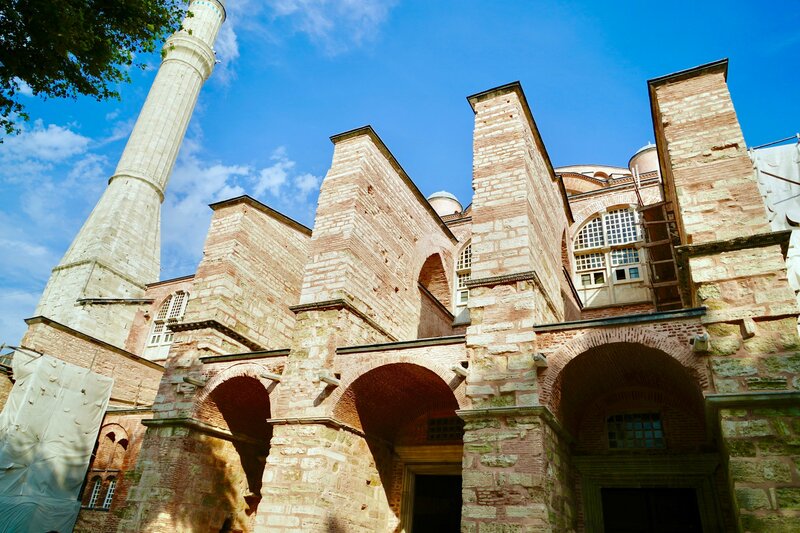 Through your impressions the reader is actually able to experience concretely the awe and majesty of the Hagia. But your work is more than a mere history lesson - you provide a discerning review of the cuisine offered in the local eateries - in this case, the food prepared in a local steak house. The fact that you noticed the church cat was endearing - it's a tabby and very vocal like my own Muse Cat. Cats are regarded by some as sacred for a reason. For instance, my own tabby prefers to listen to sacred music and I actually went to a local Christian book store to buy him his own instrumental CD of hymns - it keeps him calm and lessens the vocalizing that inspires me but drives my wife, @countrygirl, crazy, lol. john! It's so lovely to see you alive and well, it's been a while since I've seen you but as always, your comments are always very insightful, valuable and very welcome! I had a tough time with this one because like with a lot of other historical landmarks, getting into the research of the history can feel like entering a rabbit hole. I'm never quite sure how much I want to go into, or whether it would be appropriate for the post. Nevertheless, I'm glad that you did pick up on some useful information! I'm very interested in your muse cat actually - as I am with all creatures of the feline sort. In Turkey, they seem to hold cats in very high regard and that in itself is very endearing to see. 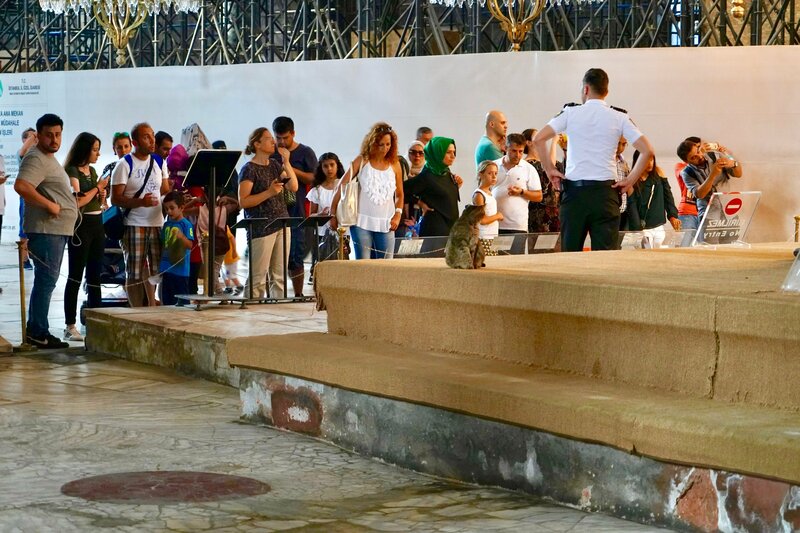 Of course, it helps that the cat inside the Hagia Sophia was very conducive to the general public and seemed to welcome all the visitors, petting it, feeding it, taking pictures with it.. It's hard to find "stray" cats like that where i'm from. I recently discovered that my own cats have certain penchant for panpipe music - it seems odd but maybe the pipe sounds ignite some kind of deep instinct from their times in the wild. Maybe i'm thinking a bit too much into it. In any case, like you, I love it when my cats vocalise! Hey @sweetsssj, I'm really glad that you are still around with us even though times for Crypto are really bad. Hope you are also able to encourage more people to continue posting on this amazing blockchain irregardless the price. Cheers and welcome back.. Your blogs are as amazing as its always been. hey bitrocker2020, i'm also glad that you're around too! I think a lot of people forget that not long ago, Steem/it wasn't in nearly as good as place as it is now. There are so many more interesting ways to interact with Steem now that I can't see it going anywhere, price low or not! Great to read you again! Lovely pics. Seems to be awesome this city! Thanks akashas! Good to see you alive and well, perhaps we might bump into each other haha! I was missing you from last one month and yet again your post is looks like a whole month's work, it's really impressive because the way you put all your experience in a post with all the required pictures that helps The reader to understand the place just like they visited the place by themselves. 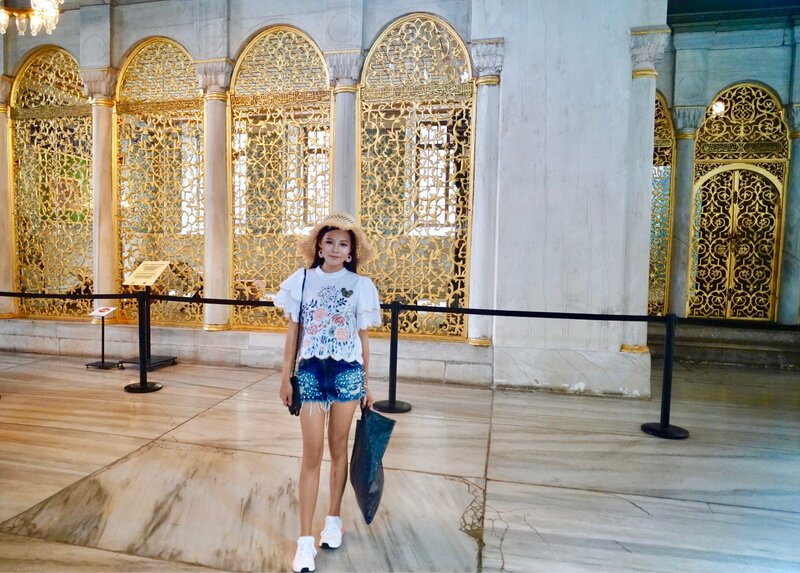 Hagia Sophia is really a nice place to visit and also helps people to see things from two different cultures Christian and Muslim in the interior is totally awesome. And I'm totally impressed by those drone shots because they really justify the beauty of that place with the sun lights on the dome that's really magnificent. 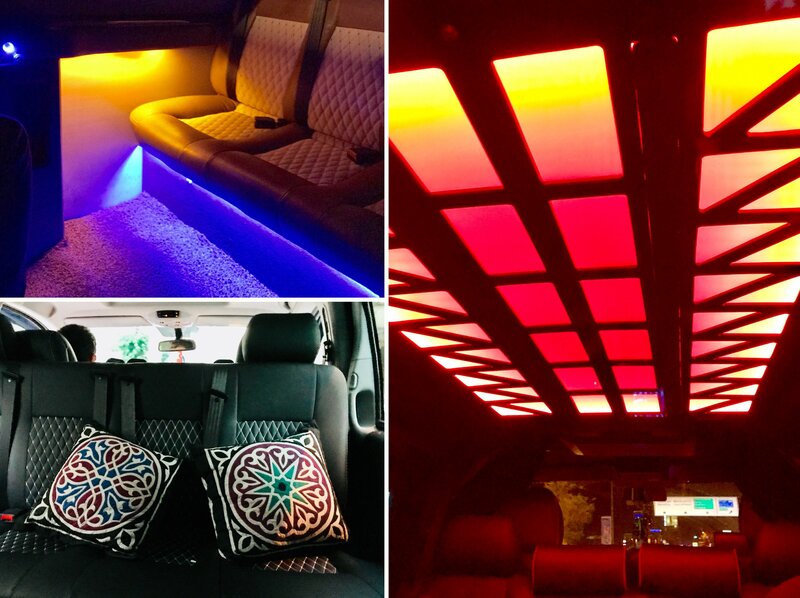 Oh my gosh the Uber was totally insane because I never so I would like that and when you just mentioned it that it was really normal on that place I really wish to go and visit Istanbul by myself Someday. Thank you dear, it's been a little less than a months work, though I have been quite busy with it as well as catching up with irl stuffs. Of course, I can't pass on an opportunity play with cats and I'm blessed to see that the cats are very well looked after not only in the Hagia Sophia, but everywhere I go in Instanbul. Good to see that you are little free now after all the work. I really miss your posts. I'm a bit of a vacation, so I'm not looking so much. 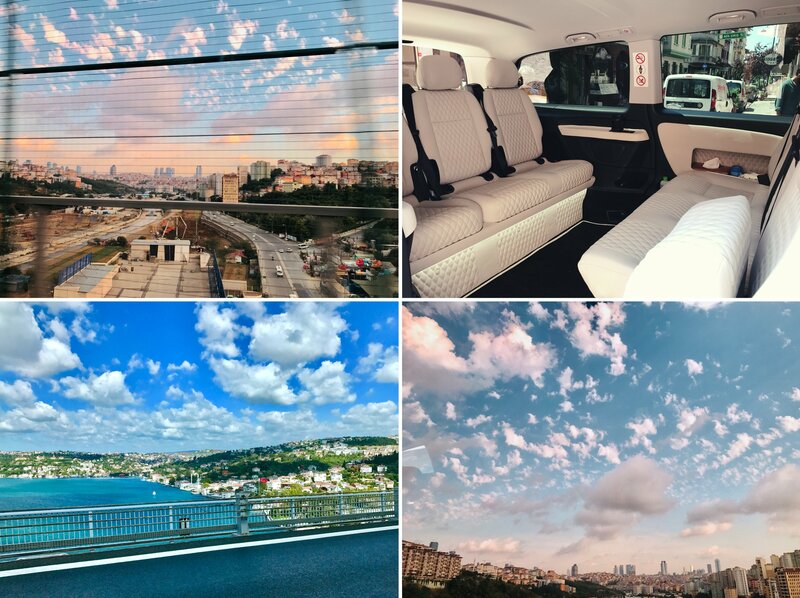 Beautiful photos of Istanbul. Besides the city and the church that I found beautiful, the food you ate seems to be wonderful. Thank you for sharing with us. Good night!!! What beautiful architecture, food and people. Fantastic work on this post, @sweetsssj! hey trincowski!! Thank you so much! 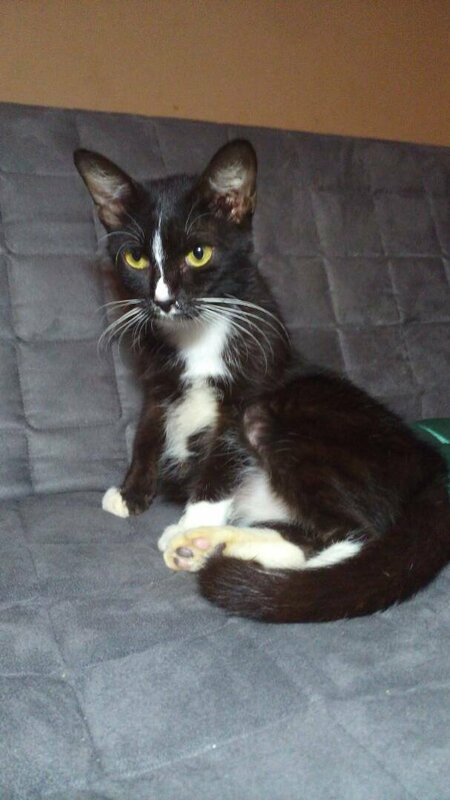 So surprised (and also not, given Turkey's love for cats) to see it roaming freely inside! @sweetsssj, After long time you comeback again to Steemit. Glad to your beauty and smile. I already watch how's Istanbul beauty. It has long proud history. Oldest and architectural buildings, locations and so delicious foods you visited and ate. Inside of Hagia Sophia awesome with decorations, lights, designs. I really like to look scene of you loving and cared to the kitty. It's mind inspiration of mine. Absolutely brilliant photo clicks and sell explained. hey dear! Sometimes it's good to take a break, but rest assured i'm very much here and not going anywhere! 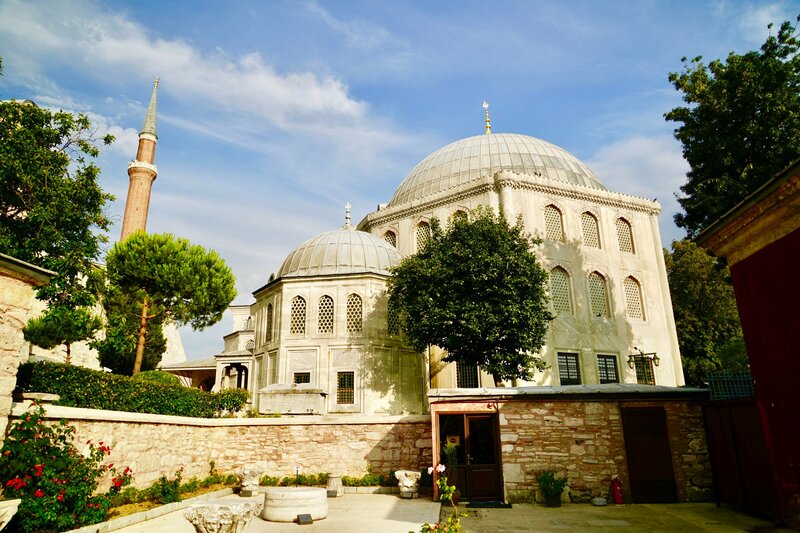 I'm also really happy you picked up the hints of Instanbul's beauty through my post, no doubt i'm very attached to this place as my blog has focused on it for quite some time! Hey Sandia, good to see you back in time for Christmas. 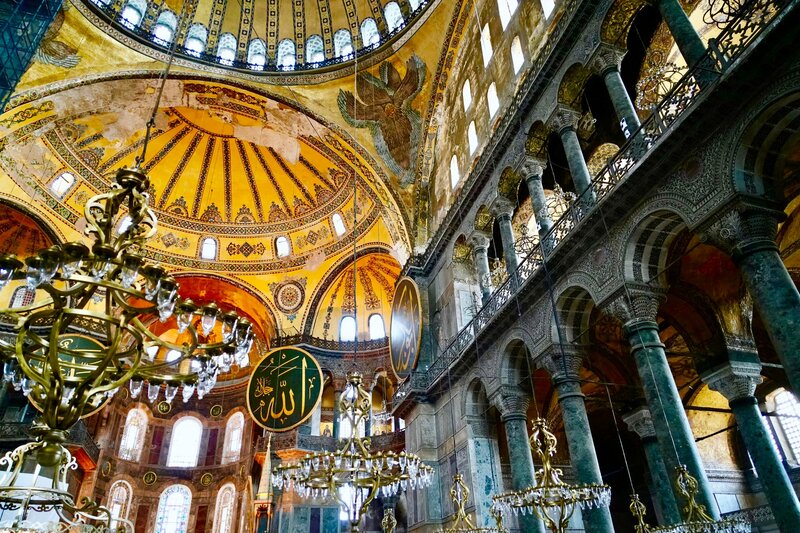 The Hagia Sophia is truly amazing. I wasn't aware that it is so big with so much of it underground. Your drone footage and shots were also a nice touch. I am glad to see it back in action. Thank you so much for letting us live vicariously through your travels! As always, it's my pleasure hanshotfirst, thank you for supporting! Thanks for this very impressive overview of a place that I've long known about, but about which I actually new few details. And as you stated, those drone shots are stunningly beautiful. The warm red light on the surface of the mosque, as well as the surrounding cityscape, landscape, and sunset view, are all impressive. I saw a documentary recently where engineers built a scale model of the central structure in the Hagia Sophia and tested it on an earthquake simulation table. Apparently the wide bands of mortar compared to most modern brick work combine with the old arches and new domes to make it almost impervious to major damage from quakes now. The test had to inflict the equivalent of several 9.0 earthquakes in a row to make the model fail. I assume the people of the time had some idea of what survived and what did not through centuries of trial and error. I'm so jealous of your travels! Upvoted to help you on your next one! I'm always amazed at the depth and number of pics your posts contain! well done! its been a while since your last post. Thank you so much! I must say, it was very impressive in person. I'm used to seeing lots of tall modern buildings where I'm from, but the scale of these mosques are truly mind boggling. lizbethk, thank you! What you don't see is the big bucket of no goods which I exclude, these ones are picked out from many not so good ones! Hey subliminal-times, thanks for sticking around for all these years and occasionally dropping by, it's nice to have you! I'm really liking the sound of Florida.. I actually stopped there on my way to Bahamas but I really need to spend some proper time! I still look forward to see you @sweetsssj here in Africa, Ghana someday. Just as @joythewanderer made it here this week, you guys make travel so amazing and steem is always so much fun. Thanks for sharing this experience as always dear. Wow i didn't realise Joy made it there! I hope I'll be able to make an appearance soon too! of course. 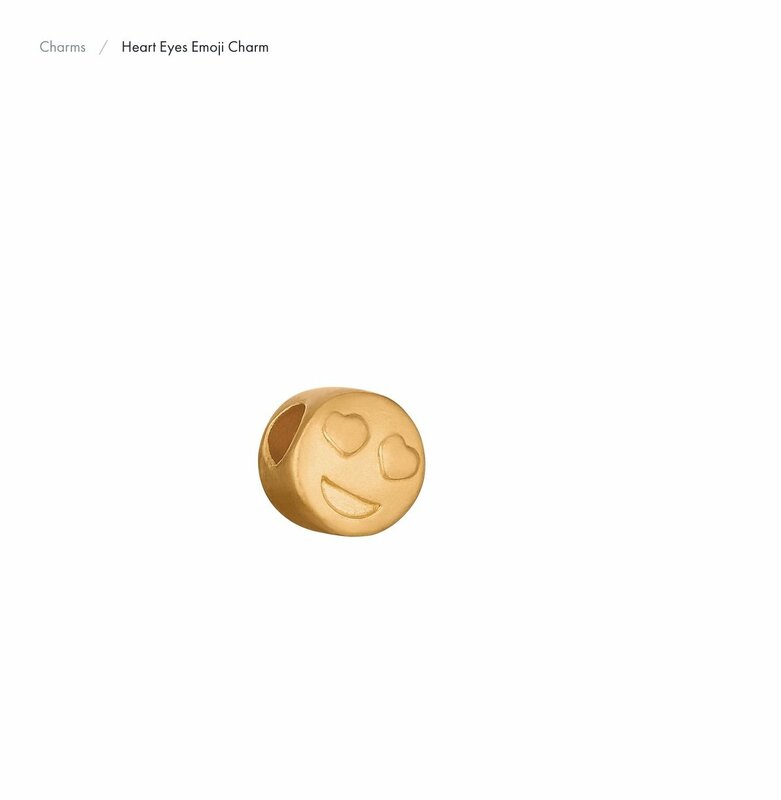 That is the beauty of steem connecting people with so much love all over the world. Steemit is a family. Hope to see you someday here dear. Thanks for sharing such a large amount beautiful photos. Are you making a global traveling? Wow! Beautiful place! Istanbul is so underrated. I rarely see Istanbul being promoted as a great tourist destination. A heck of a lot of fun! Yes, the history is writhe with controversy but that's what makes it so interesting, don't you think? thank you dear, good to be back! Nice to see your amazing face after such a long time stay here i am glad to see an amazing post. aww dear, thank you, it's also great to see you still active and doing well ! Hi @sweetsssj long time no see, and great to see you back with another great post! Hope you're doing well! Good to be back! Very glad to see you still around too!! I read a lot of different posts about Hagia Sophia. Your post is the favoured, biggest, colourful and grateful. I can’t believe how many times you said “gold!” I’m SO EXCITED!!!! well, if it makes you feel any better, I do think of you each time I type the word gold.. I really enjoyed knowing that there is a museum in Turkey with these great features. Wonderful photos! Thank you for sharing. I am Regular Reader of Your Website. Thanks For sharing such a amazing article, I really love to read your content regulearly on Your Blog. Your blogs and vlogs are always so beautiful.i’m sure it takes time to do.you yourself are very beautiful.and talented.i once saw your blog page on cats.i love cats I’m going to follow those blogs too. Haha what a coincidence, I wonder what the relationship with the naming convention for that is. Do you happen to know? Supercalifragilisticexpialidocious!...with regards to that "Cat", Hagia Sophia" and your beautiful travelogue as well! @sweetsssj actually am just 1-1/2 month old, more of like new to Steemit. 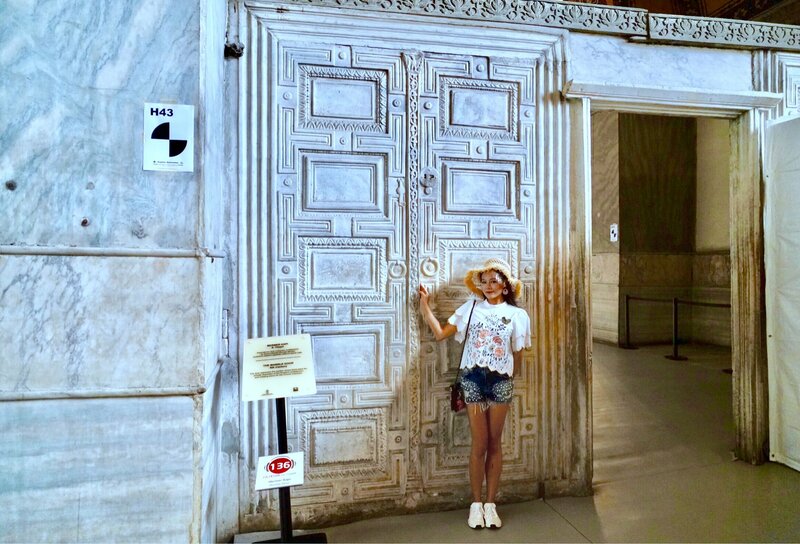 "Has anyone else ever come across doors that were carved but not real doors? Do you know why this might have been done?" You mentioned it as doorway, so i am asking this question. Did you find this door outside? if so, this maybe done to confuse the attackers and i sense that small door might not have been in those days. This is just my assumption. 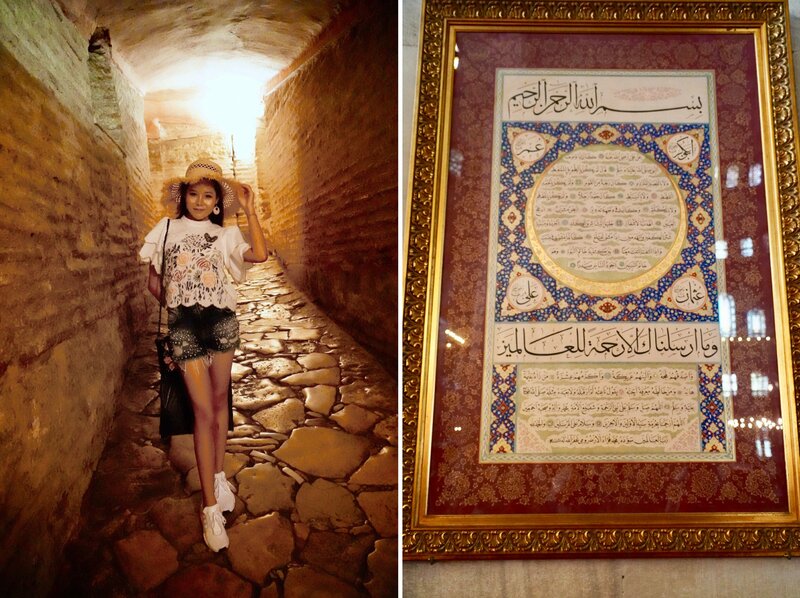 A big thanks @sweetsssj for taking us through this wonderful and beautiful journey of Hagia Sophia! Hi there, can I ask you about voting bot? do you still run it? What a an amazing building Hagia Sophia I was few months ago in Istanbul one of the most beautiful cities I have ever visited. 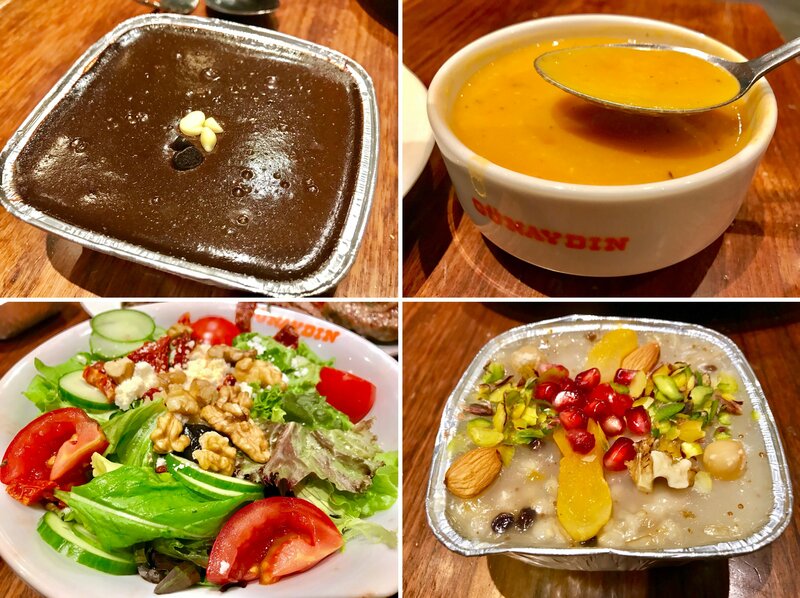 Your post is a further evidence of its attractiveness and how delicious is Turkish food !!! They are something we never stop to discover .....Including the wide range of cats around the city which I found it is massive :) :) I hope to come back there very soon!!! Excellent !! Visit my blog and help me with your vote. Ho Ho Ho! @sweetsssj, one of your Steem friend wished you a Merry Christmas and asked me to give you a new badge! SteemitBoard wish you a Merry Christmas! May you have good health, abundance and everlasting joy in your life. To see who wanted you to receive this special gift, click here!